TOKYO -- Twelve people, including eight soldiers, skiing on the slopes of a volcano near a famous hot spring resort in central Japan were injured Tuesday by flying rocks during a sudden eruption, officials said. One soldier later died. The eight soldiers were in a group of 30 who were undergoing ski training when they were hit by the volcanic rocks, defense officials said. A military helicopter airlifted the first group of eight skiers to safer ground, according to footage shown by NHK public television. 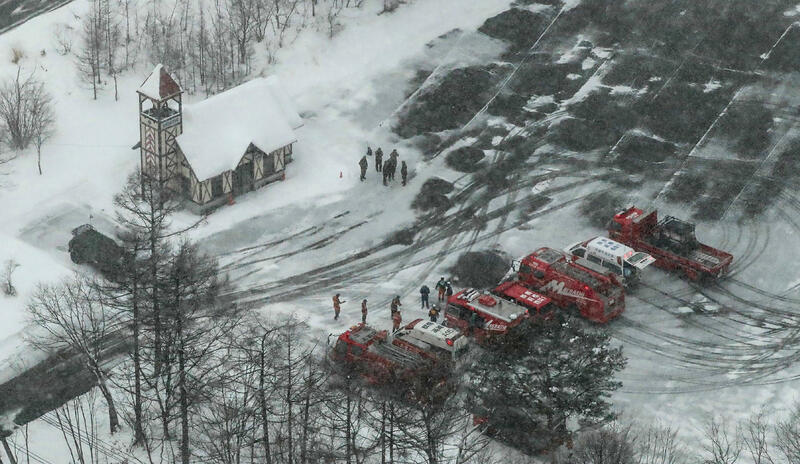 The rescued skiers, wearing helmets, were handed a bottle of tea each and escorted into a cabin. The slopes were filled with volcanic ash and rocks and rescuers were considering whether using snowmobiles to reach the stranded skiers was safe. An earlier report that one or two people had been injured by shattered glass when rocks struck a gondola had not been confirmed. Kusatsu-Shirane last erupted in 1983. Japan sits on the Pacific "Ring of Fire" and is prone to earthquakes and volcanic eruptions. An eruption of Mount Ontake in 2014 killed about 60 people. Several other Japanese volcanoes are considered unstable with small eruptions in recent years.